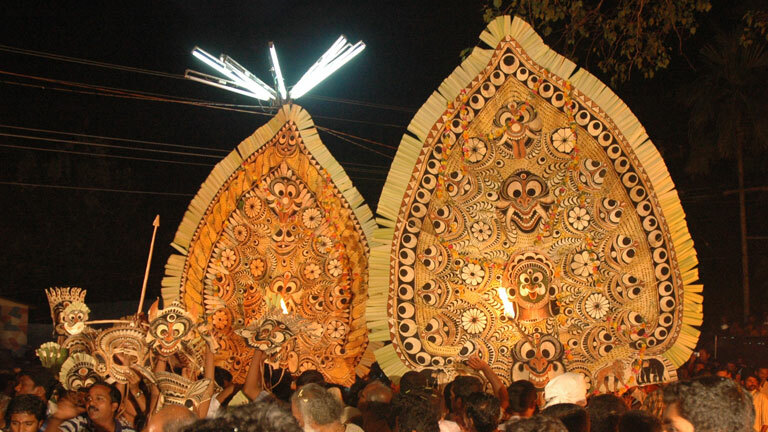 Padayani is a ritual art form performed at Bhadrakali temples located on the banks of river Pampa. According to mythology, this ritualistic dance commemorates the dance performed by Lord Shiva and the other Gods to appease Goddess Durga, whose anger could not be quenched even after annihilating the demon, Darika. Popular places where Padayani is performed are Kadammanitta, Kottangal, Othara, Kunnanthaanam and many other temples in south Kerala. Though traditionally, it lasted for nearly two weeks, now-a days, it is held for durations that are as short as a single day. Kolam thullal is the major portion of Padayani performance. Kolam is a masque made by drawing images on the leaves of the arecanut palm. Wearing this Kolam, padayani dancer performs the ritual dance in devotion. These Kolam are representations of spiritual forces or divine characters, and are depicted with terrifying and spectacular face masks and head gear, painted in vivid colours like deep red and black, using natural powders. They include the Ganapathi Kolam, the Yakshi Kolam, the Pakshi Kolam, the Maadan Kolam, the Kaalan Kolam, the Maruthaa Kolam, the Pishachu Kolam, the Bhairavi Kolam, the Gandharvan Kolam and the Mukilan Kolam. Padayani is essentially a communal activity where villagers are actively involved in collecting arecanut palms and participate in the making kolam. Kolam thullal starts on the same day as the Kappoli. For the Kolam thullal, the thappu is the main instrument. The Chenda and the Kaimani are also used. Padayani songs are very attractive. Only those who have undertaken rigorous physical training and discipline in the traditional ways can take part in the Padayani ritual. A special diet regimen that allows for physical and spiritual cleansing, is also to be followed prior to the event.